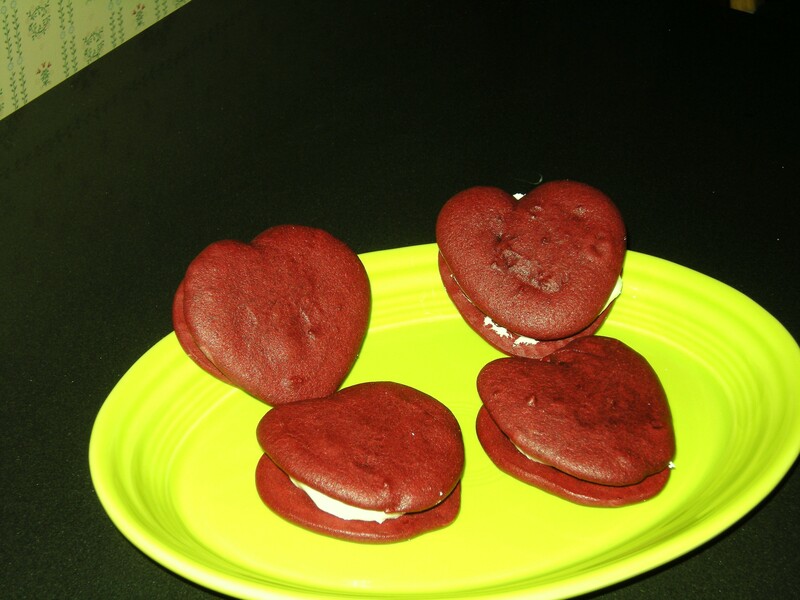 I decided to try making red velvet whoopie pies because it’s almost Valentine’s day. What an experience! I read many people’s recipes and their comments before I settled on a recipe. Then I drew a heart on some thin cardboard cut it out and and then traced them onto parchment paper so I would have a guide for the cookie dough. I prepared two cookie sheets that had 16 hearts each. Then I whipped up the cookie dough using my stand mixer. I recently bought an electric cookie press that I decided to use today for the first time to pipe the dough into the heart shapes. I had opened the cookie press up earlier and washed it so it would be dry when I was ready to use it. So I filled it up with this unbelievable red cookie dough and then I couldn’t get the tube holding the dough to connect to the rest of the cookie press. After trying and getting way too frustrated, I decided to try my pastry bag, but discovered none of the tips had a big enough hole. So remembering all that I had read, I defaulted to putting the dough in a small ziplock bag and snipping off the corner so I could use it to pipe the dough into the heart shapes. I managed to get fourteen and ran out of dough in the bag. So I baked those and decided it was so time consuming to try to make hearts that the rest of the cookies would be round iinstead. I then dropped of tablespoons dough onto the other parchment lined cookie sheet using the rest of the dough. Some of my heart-shaped ones came out pretty good while others were so so. The picture below shows four of them that came out pretty well. I plan to take those to my Mother tomorrow. She used to bake Red Velvet Cakes after I had moved away and I thought she’d like them. I’ve never tasted Red Velvet Cake, but these whoopie pies tasted pretty good. Making hearts is time consuming but worth doing for the experience so you can make something fancy should you need to. However, I would only do it for a special occasion because the round pies taste just as good. I used dark cocoa powder and dark brown sugar for mine so they came out a darker red. At the above website you’ll find many recipes for whoopie pies and several for red velvet whoopie pies. The specific link to the recipe I used is: http://annies-eats.net/2010/02/08/red-velvet-whoopie-pies/ I hope if you try to make these that you have better success than I did. I think I would have done better if I had not tried to use the cookie press with this recipe for the first time. I ended up having red cookie dough all over the kitchen counter, pot holders, etc. — good news is it cleaned up easily. I felt as if I might have it all over my face and hair too, but luckily I didn’t.